The post Coinimal And Bitstamp Make Using And Buying Bitcoin Easier appeared first on CCN: Financial Bitcoin & Cryptocurrency News. The post Crowdsale Set Jan. 18 For PinkCoin, The First Diamond – Backed Cryptocurrency appeared first on CCN: Financial Bitcoin & Cryptocurrency News. The post Write for CCN appeared first on CCN: Financial Bitcoin & Cryptocurrency News. The post BitFury to Mass Produce New 16nm Chip and Sell to Public appeared first on Bitcoin Magazine. The post Bitcoin Price May Fall Through The Line appeared first on CCN: Financial Bitcoin & Cryptocurrency News. Andreas Schildbach, one of the developers of the popular Bitcoin Wallet app for Android and maintainer of alternative Bitcoin implementation Bitcoinj , calls for a block-size increase to allow for more Bitcoin transactions. Rather than relying on additional layers built on top of the blockchain, Schildbach believes the network should be designed to scale “on-chain”, too. “I personally will not invest my time in lightning networks, at least not for solving the Bitcoin scalability issue,” Schildbach told Bitcoin Magazine . The block-size dispute – which represents a trade-off between thenumber of transactions the Bitcoin network can handle and its decentralization – has taken a bit of a turn since a large segment of Bitcoin's academic and engineering community discussed the issue at the upcoming Scaling Bitcoin workshop in Hong Kong on the 6th and 7th of this month. Core developer and Blockstream co-founder Pieter Wuille’s Segregated Witness , in particular, is embraced by many within Bitcoin’s development community. As part of a scalability roadmap that needs no hard fork, the proposal could help allow added scaling layers such as the Lightning Network to be rolled out. Schildbach, who maintains Bitcoinj alongside Mike Hearn (who’s also lead developer of Bitcoin XT) believes raising the block-size limit through a hard fork needs to happen sooner rather than later, however. While most within the Bitcoin development community believe the block size needs to be increased at some point even with Segregated Witness on the table, opinions still differ on when and how to do this, exactly. Andresen's proposed solution,BIP 101 , was implemented by Hearn into Bitcoin XT, and is programmed to increase the maximum block size to 8 megabytes if a threshold of 75 percent of mining power accepts the change. Once activated, this limit is set to double every two years for 20 years, ultimately leading to an 8-gigabyte block-size limit. An alternative idea isBlockstream CEO and hashcash inventor Dr. Adam Back's “2-4-8” quick fix, which would incrementally increase to the limit 8 megabytes over four years. Similarly, Bitcoin Core developer Jeff Garzik’s BIP 102 (or his similar “BIP 202”), proposes a bump to 2 megabytes. Combines with Segregated Witness, this could effectively provide for up to 4 to 8 megabyte blocks, too. Schildbach, who maintains Bitcoinj alongside Hearn, indicates to be willing to accept almost any solution the Bitcoin community decides on. Schildbach is sceptical about any solution that does not involve a block-size increase, however. According to the developer, whose Bitcoin Wallet has been downloaded more than a million times, additional layers built on top of Bitcoin designed to scale the system would make things needlessly complicated – and take too long to develop. The post Bitcoin Wallet Developer Andreas Schildbach: I Will Not Invest My Time in Lightning Networks appeared first on Bitcoin Magazine. HSBC just promised to waive all charges customers may be incurring as a result of a two-day online banking outage due to a technical glitch. "Our customers continue to have issues with HSBC online and mobile banking. We profoundly apologise for any inconvenience this has caused. "We will ensure customers do not lose out as a result of this issue. Any fees customers incur as a result of this outage will be waived. "There is a complex technical issue with our internet banking systems, and our IT team has been working non-stop since yesterday morning to find a solution. This has involved many tests, diagnostics and trial runs. We are getting closer to solving the problem, but are not there yet. We can, however, confirm this is not a cyber-attack or any other malicious act. "We have mobilised all our available resources to cope with the increased customer demand in our call centres and branches, and they are doing their best; however, due to very heavy volumes we ask for your patience. "We will continue to provide regular updates." Since Monday, HSBC customers are unable to access their online banking accounts and many are reporting they are able to get to their accounts via mobile banking. @HSBC_UK I can't login and I'm overdrawn as I can't transfer money to cover it, best not be charged daily fee !!! @HSBC_UK your internet banking is down and I am trying to add funds between accounts so that I don't get charged. Today, bitcoin is thriving like never before. Or hadn't you heard? The post Thought Bitcoin Was Dead? 2016 Is the Year It Goes Big appeared first on WIRED. The post Binary Options: Intriguing Investment Opportunity for Bitcoin Users appeared first on CCN: Financial Bitcoin & Cryptocurrency News. The post Pennsylvania State Law’s Take on Bitcoin Delayed appeared first on CCN: Financial Bitcoin & Cryptocurrency News. The post Bitcoin Wallet App Promoted by Mike Tyson Gets Coverage appeared first on CCN: Financial Bitcoin & Cryptocurrency News. SHANGHAI (Reuters) - China's six-month-old campaign to calm share markets will be put to the test when stocks reopen on Tuesday, a day after selling triggered an unprecedented trading halt and risked undermining state rescue efforts estimated to have cost around $140 billion. China's major stock exchanges tanked on the first trading day of the year on Monday, triggering a "circuit-breaker" that halted equities trade nationwide for the first time and put at risk months of regulatory work to restore market stability. The selloff saw the CSI300 index <.CSI300> of the largest listed companies in Shanghai and Shenzhen lose 7.0 percent before trading was suspended, its worst single-day performance since late August 2015, the depth of a summer stock market rout. And more weakness may be in the cards on Tuesday if the behavior of a U.S. exchange-traded funds tracking mainland China shares is a guide. The Deutsche X-trackers Harvest CSI 300 China A-Shares ETF slumped nearly 10 percent in U.S. trading, hitting its lowest since October 2014, before ending the session down 8.5 percent. Shares of several Chinese firms that trade primarily in U.S. markets, and are not subject to Chinese trading restrictions, slumped as well. Alibaba Group Holdings Ltd shed 5.6 percent and Baidu Inc. fell by 2.7 percent. The Bank of New York Mellon China ADR Index <.BKCN> lost 4.0 percent. The collapse, which followed the release of weak economic data, raises fresh doubts about regulators' capacity to wind back trading restrictions implemented in the wake of a summer stock market crash in which major indexes lost as much as 40 percent before Beijing intervened. Many analysts attributed the decline to the imminent end of a six-month lockup on share sales by big institutional investors. Major Chinese brokerages and asset management firms spent vast sums to buy up shares during the crash in a state-coordinated rescue that Goldman Sachs estimated at the time to have cost around 900 billion yuan ($138 billion). "This is quite unexpected," said Gu Yongtao, strategist at Cinda Securities, said of Monday's fresh sell-off. "The slump apparently triggered intensified selling, while the trigger of the circuit breaker seems to have heightened panic, as liquidity was suddenly gone and this is something no one has experienced before. It was a stampede." Haitong Securities analysts had earlier estimated that up to 1.24 trillion yuan worth of shares would be freed up for sale by next Monday, assuming the lockup period is not extended. 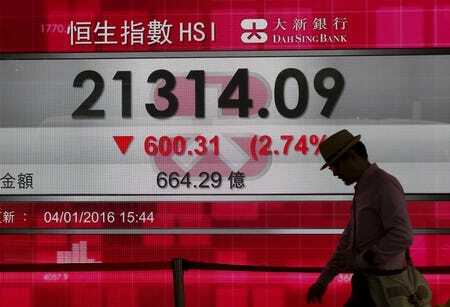 Early trading in Asia markets on Tuesday showed prices easing further. China's yuan currency hit its lowest level in more than four years in both onshore and offshore trade on Monday, amid nervousness about weakness in Chinese manufacturing despite Beijing's surprise currency devaluation in August. Concerns about yuan selling have prompted China to start policing its currency market in a way traders have rarely seen before, levying penalty payments for aggressive trading and prompting some banks to turn down business. The central bank has also temporarily suspended at least three foreign banks from conducting some currency business, sources say. China's response to the summer market crash was seen by many inside the industry as heavy handed, as it included suppression of futures and derivatives markets and instilled fear as regulators pulled in brokerage executives for questioning about insider trading and "malicious short-selling." While that stabilized indexes, it also suppressed trading volume and poured cold water on foreign investors, who began moving out of Chinese shares. However, authorities recently showed signs they believed indexes had stabilized, in particular by allowing initial public offerings (IPOs) to resume in November, a vote of confidence given it was a flood of IPOs that was blamed for setting off the crash in the first place. The circuit breaker mechanism was triggered on the day it came into effect. It halts trade for 15 minutes if the CSI300 index falls or rises 5 percent in a day, then suspends trade for the day if it continues to fall or rise to 7 percent. Chinese individual shares had already been subject to a 10 percent intraday trading range. Some analysts doubted the efficacy of the new measure. 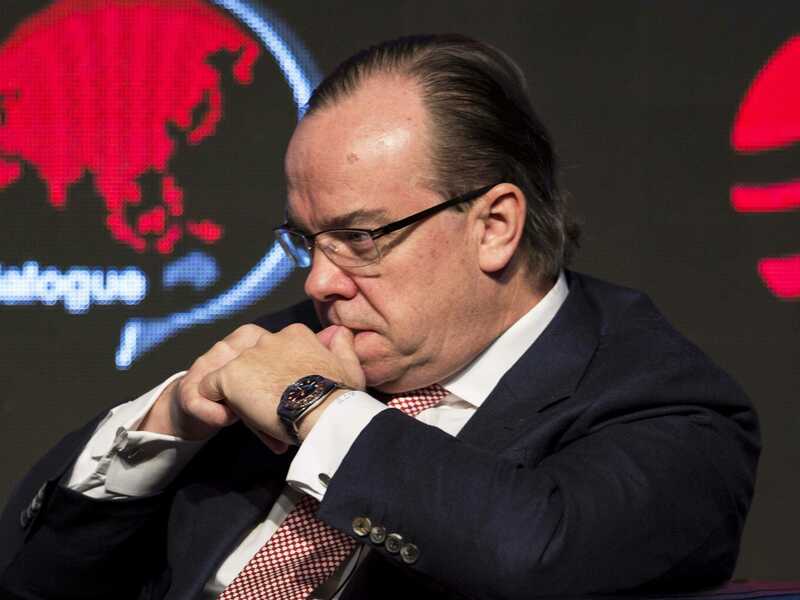 "Without the circuit breaker mechanism, the market wouldn't have dropped so much," said David Dai, Shanghai-based investor director at Nanhai Fund Management Co.
"The mechanism deepened investor panic, and limited trading." Dai added that the circuit breaker would embolden market bears, as they did not have to worry about a late-session rebound. He suggested it should be scrapped or modified. Market reforms put on hold by the crash could be delayed further if the circuit breaker fails to calm markets - which had recovered more than 25 percent from the pit of the crash prior to Monday's correction. A sell-off could prompt regulators to re-freeze IPOs to preserve liquidity, extend the share lockup to prevent more selling, and keep the "national team" of brokerages and asset managers on the hook to keep buying and holding stocks at a loss.